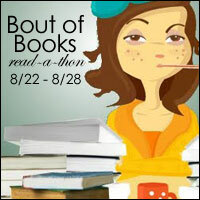 Running from Monday 22nd to Sunday 28th, Bout of Books is a week long readathon full of bookish challenges, chat and most importantly, reading. Read, read, read! This is my second time participating in Bout of Books, and this year I decided to update on my progress with mini wrap up posts at the end of each day. Over the duration of Bout of Books I managed to read a total of two books and began a third book in ebook format, reaching the 30% mark. I started the week delving into Inside the O'Briens by Lisa Genova. I'd had this book on my TBR for a while and thought it would be a great starter book for the readathon as I've found all her other books to be gripping page turners. I was proven right and completed the book by the end of Day 2. Next up I moved on to The Woman in Cabin 10 by Ruth Ware - the pick for a new to me Twitter book club I've recently joined. Knowing the chat for the book club was to take place on the 28th, I wanted to read the book as close to the chat as possible. Although it did take me a little longer to read this title than I thought, I completed it in 3 days, I had an enjoyable read. Having read The Woman in Cabin 10 in ebook format, I thought I'd stick to ebooks and picked up a recently purchased book of mine - It Ends With Us by Colleen Hoover. This is my first reading experience of her work, and I am stepping out of my comfort zone a little, but I've heard so much admiration for the author's work I just had to check it out. As I mentioned above, I ended the readathon 30% in but I definitely see the book being finished by the end of August. Overall I'm really happy with my Bout of Books experience, and eagerly await the next one! How did your Bout of Books experience go? I think you did great. I have considered Colleen Hoover also, which is out of my comfort zone. I really want to do reviews of the other 2 but the longer it goes means I might not review them. Thanks, Marce! Colleen Hoover's writing is pretty far outside my comfort zone, but having finished It Ends With Us just this morning, I think I'd be sure to check out more of her work. It can tough to catch up once you get behind on reviews - hope you find a solution that works for you! Thanks, Lindsey! I'm surprised you've never taken part in Bout of Books! You did awesome all week!! Great job! I'm glad you enjoyed your books, too. I liked The Woman in Cabin 10. And I'm SO happy you're reading It Ends With Us!!! I hope you end up liking it! Thanks, Brandie - it sounds like you had a great Bout of Books experience also! I finished It Ends With Us just today and was very much blown away by Colleen Hoover's writing; far outside my usual reading comfort zone, but I'll be sure to check out more of her work. Thanks - I love a good readathon!